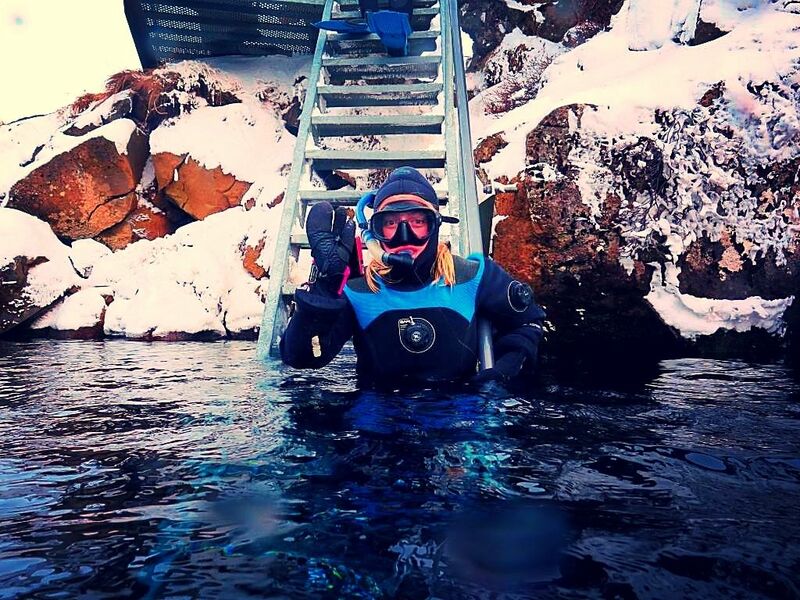 If there is one thing I can confidently say that I thought I would never do, not in a million lifetimes, snorkeling in water that is just barely above freezing temperatures would be that thing. 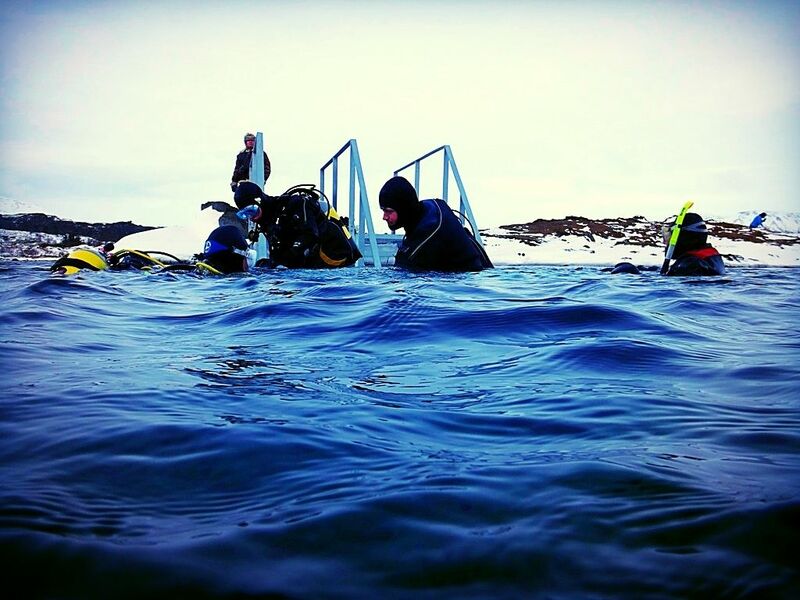 Granted, two years ago I never thought I would go snorkeling at all on account of the fact that I couldn't swim, but even that wouldn't have mattered in Iceland's 35°F waters where special dry suits keep you impossibly buoyant. 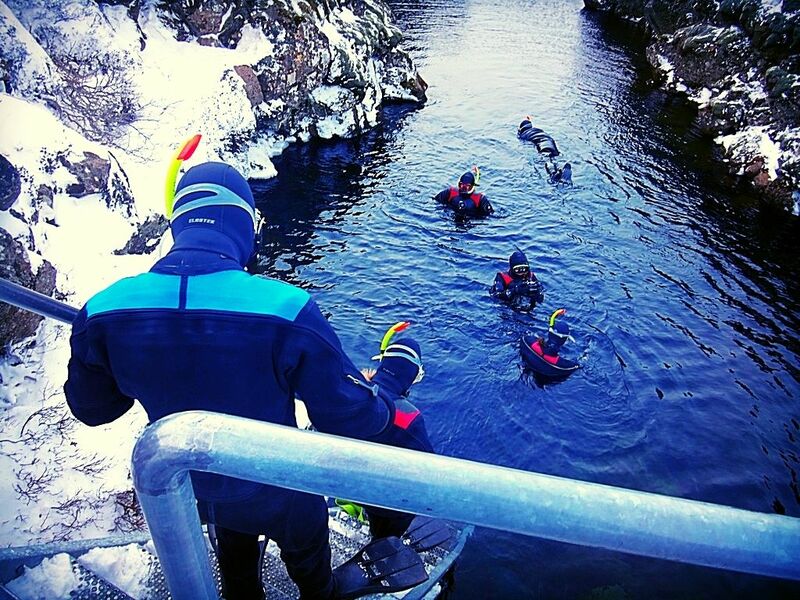 Still, swimming capabilities or not, who voluntarily jumps into water that cold... in the middle of winter? Crazy people, that's who. And, well, me. 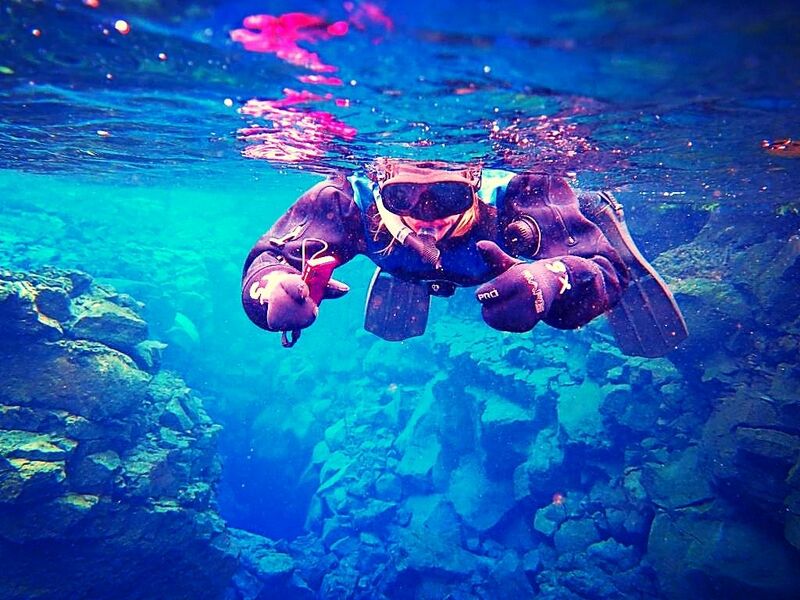 Because when you have the opportunity to snorkel in the fissure between two tectonic plates, in some of the clearest water in the world, you take it. 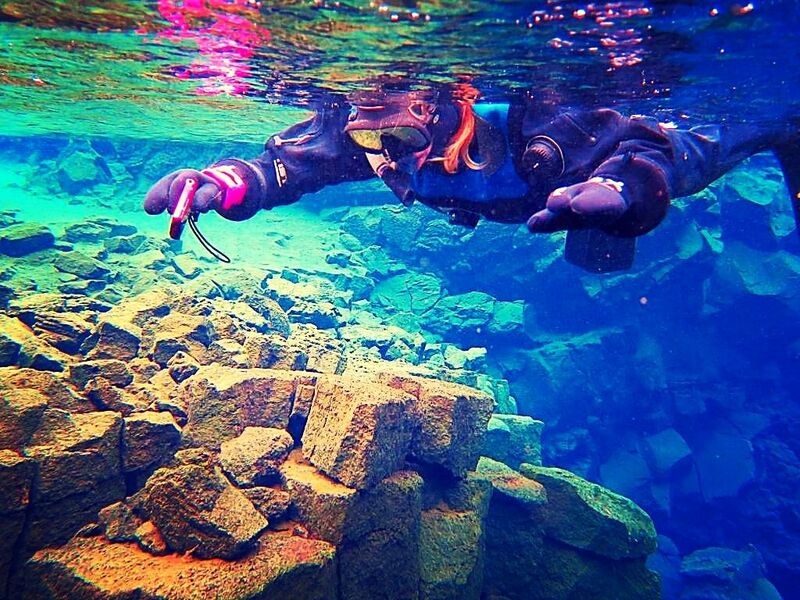 The Silfra Fissure is located in Iceland's Þingvellir National Park, in the space between North America and Europe's continental plates. 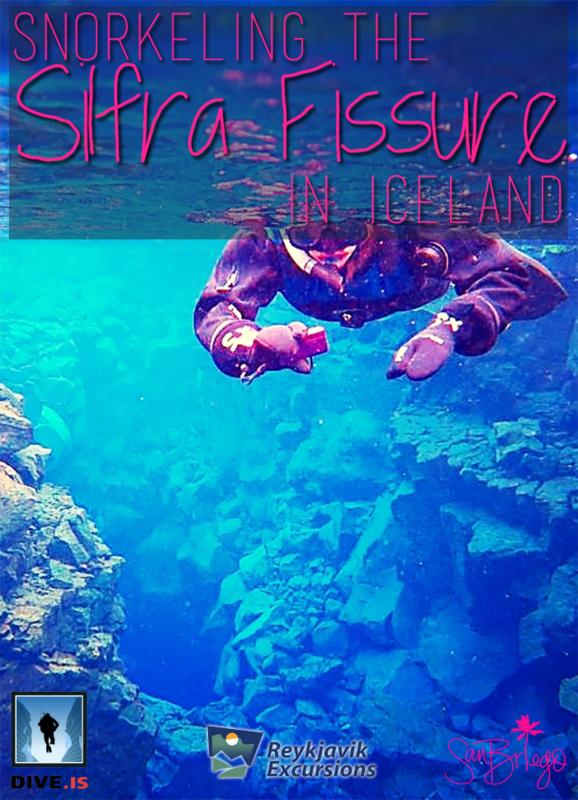 And when I was planning my Icelandic adventures with Reykjavik Excursions, my travel guide encouraged me to read up on their Silfra snorkeling tours with the premier Silfra snorkeling guides, Dive.IS. At first I scoffed at the idea. 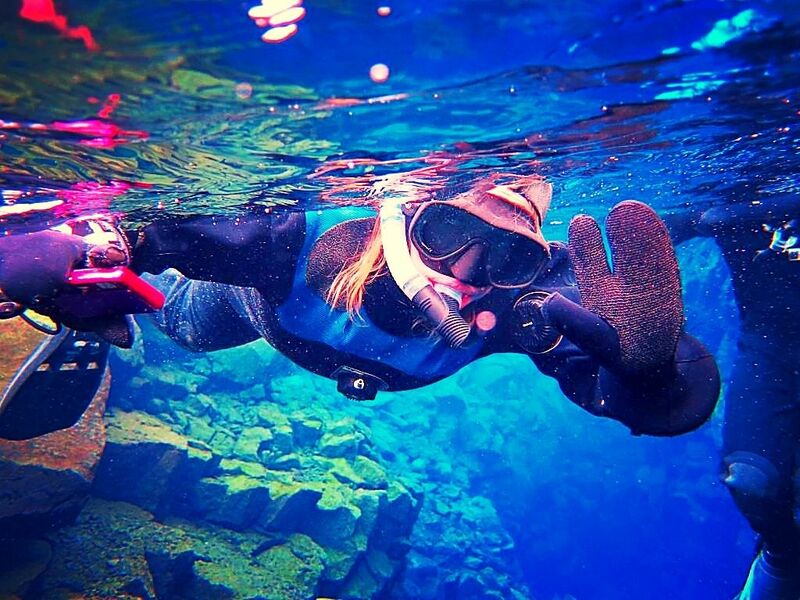 Snorkeling in Iceland? In Februrary? I didn't hate myself or anything, so I had no reason to believe this would be a good idea. 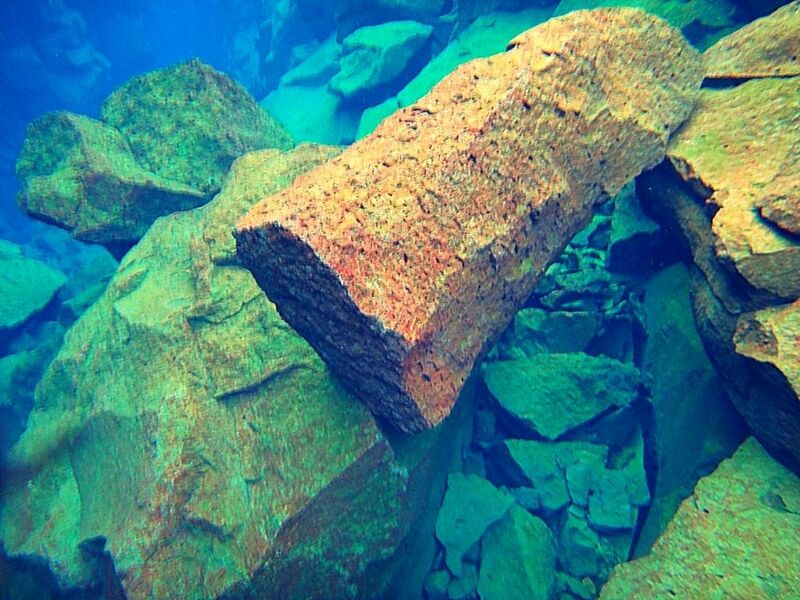 But the more I read about the amazing waters of Silfra and their 100+ meters of underwater visibility, the more I became mildly obsessed with it. 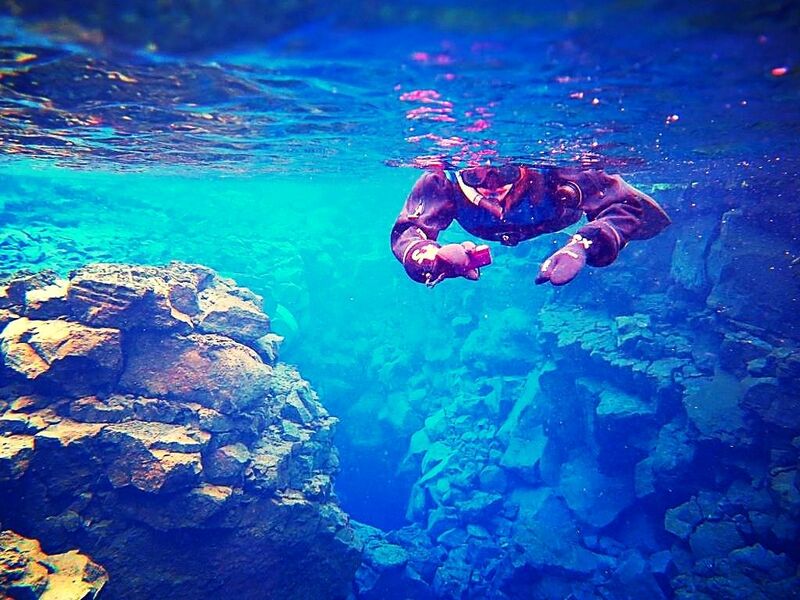 It was only when it looked like all the tours might be sold out that I realized just how badly I wanted to experience snorkeling Silfra. 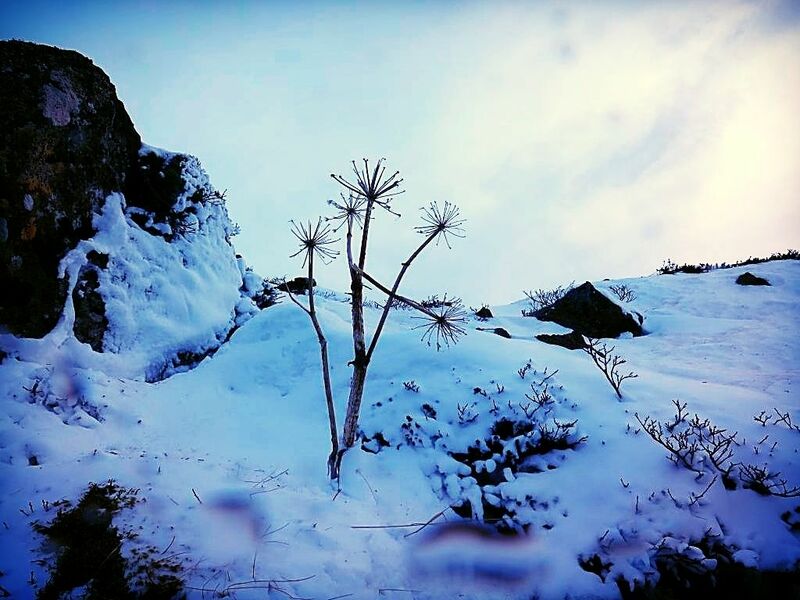 Thankfully, my awesome agent at Reykjavik Excursions had the persistence and connections to make it happen. 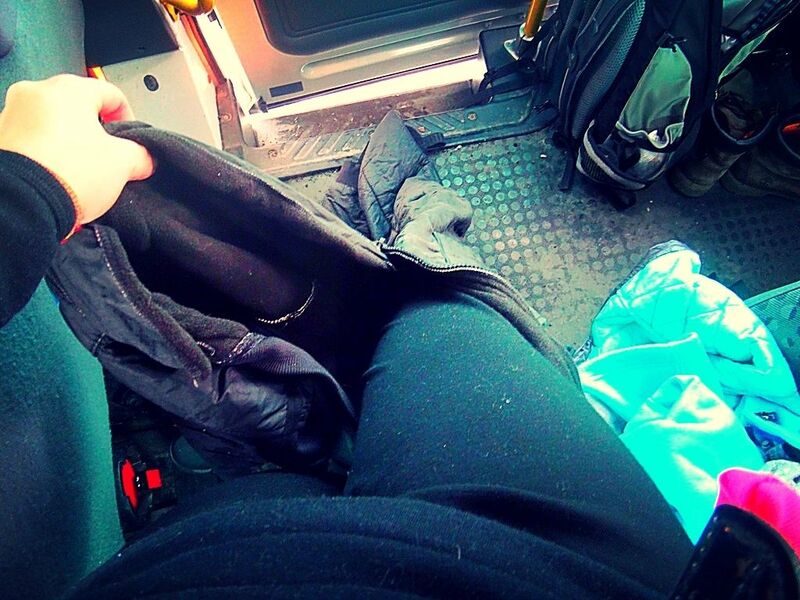 Which is why on my third day in Iceland, I woke up, got dressed, and hopped in the Dive.IS shuttle bus with 8 other crazy people. 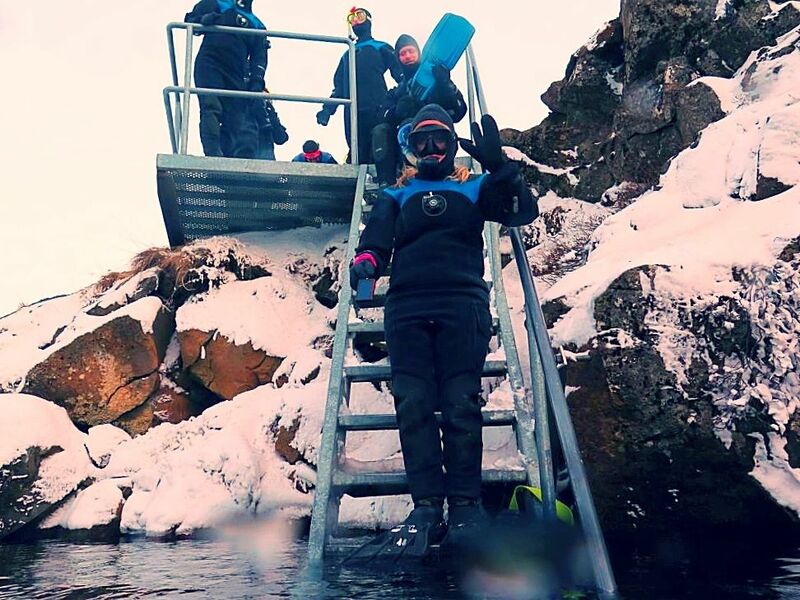 Because the fissure is located right in Þingvellir, I highly recommend doing the snorkeling excursion as part of your Golden Circle tour so that you can make the most of your time in Iceland. However, if you can't, it's definitely worth it on it's own. 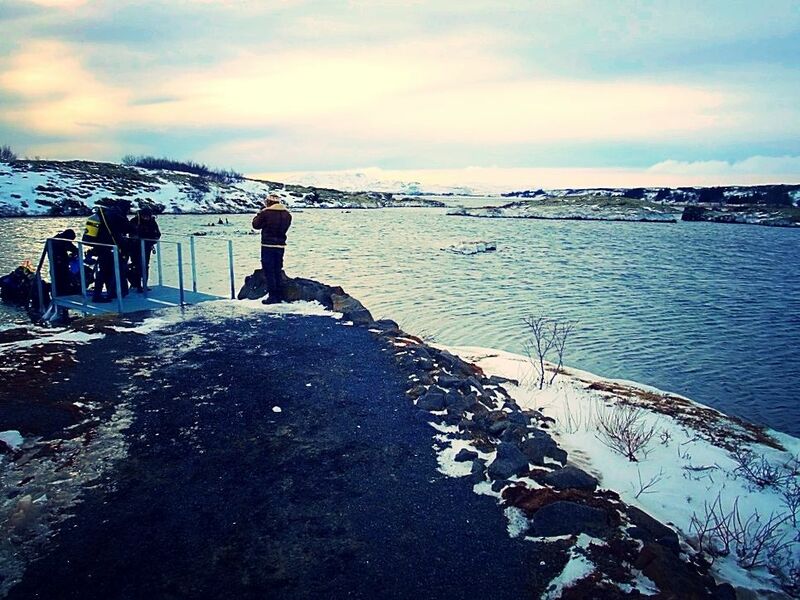 Our excursion took around 6 hours from pick up to drop off, but it can take longer depending on the number of other tour companies at Silfra at any given time. When our shuttle pulled up there were at least a dozen other vans in the parking lot... some tours had just ended and some were just about to begin. We parked the shuttle,piled out and followed our tour guides to the entry point of the fissure so that we could see what we were getting into. And as soon as we stepped out into the frigid wind, I immediately started questioning this decision. All of us were shaking while our tour guide tried to convince us that we'd be warmer in the water than we were at that moment. He then told us that several of the guides would be in the fissure with us, helping to keep us all in a herd, take pictures and be there in case we panicked and needed to get out. This was super reassuring and I was glad to hear it. He also shared that while we would be dry for the most part, our face and hands would get wet. Our faces, he explained, would quickly be numb to the cold, and our hands, while they could get a bit painful from the cold, would be insulated by a layer of water in our gloves that would warm to our body temps. I was skeptical, but I was there, so there was no turning back now. I headed back to the shuttle, pulled on the insulating thermal overalls they provided, and climbed outside so that I could be suited up in my dry suit. 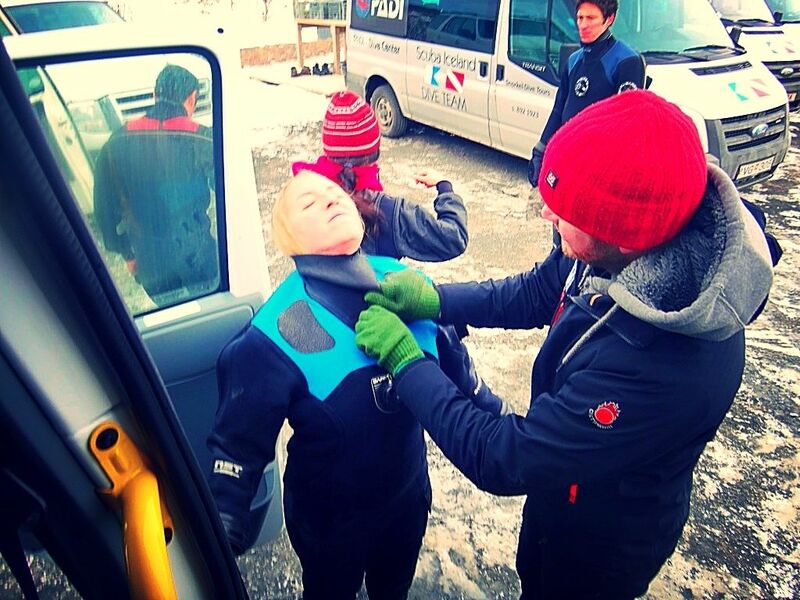 Dry suits, as opposed to wet suits, are much thicker and have extremely tight seals around the neck and wrists. Dive.IS even adds a collar to make the seal around the neck extra tight, something I didn't see any of the other companies doing. And believe me, you want that seal! 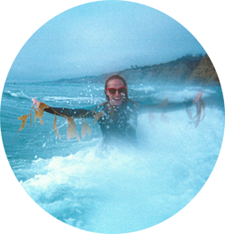 My face may be able to handle frigid water, but my body sure couldn't. Another bonus of Dive.IS's suits were that they were one piece down to the feet, meaning that there wasn't a separate set of shoes we had to pull on. Meaning that there were two less seals I had to worry about the water breaching! 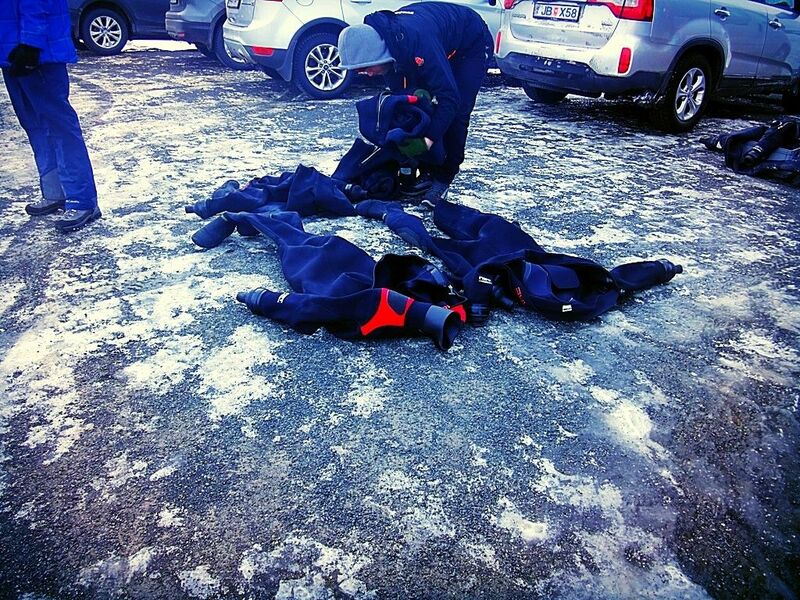 After they helped me into my dry suit, it was time for my neoprene hood, gloves, and flippers. 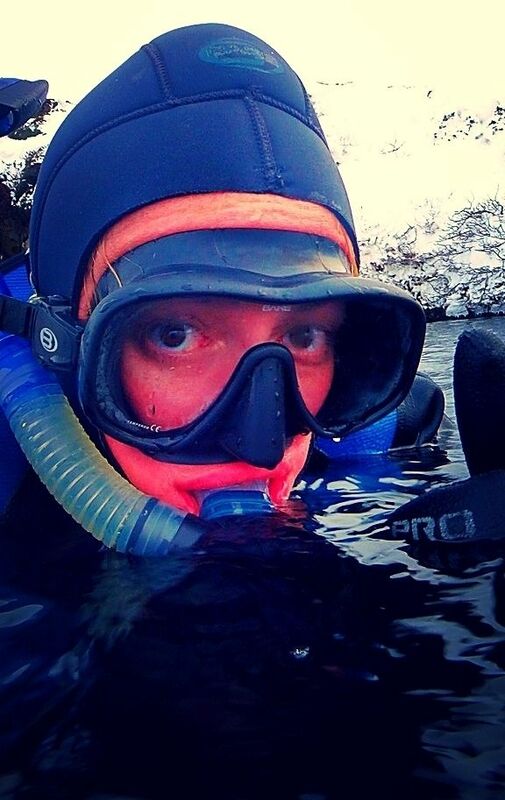 The final piece was my snorkel mask which I put on just before awkwardly waddling my way down the stairs into the black water. 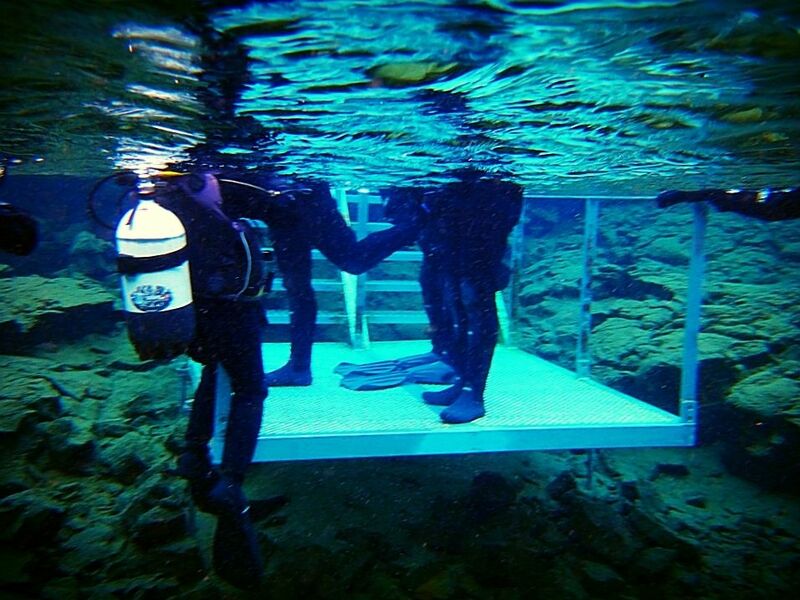 Walking off that last step, I didn't expect to be as buoyant as I was, but the dry suits really keep you afloat. 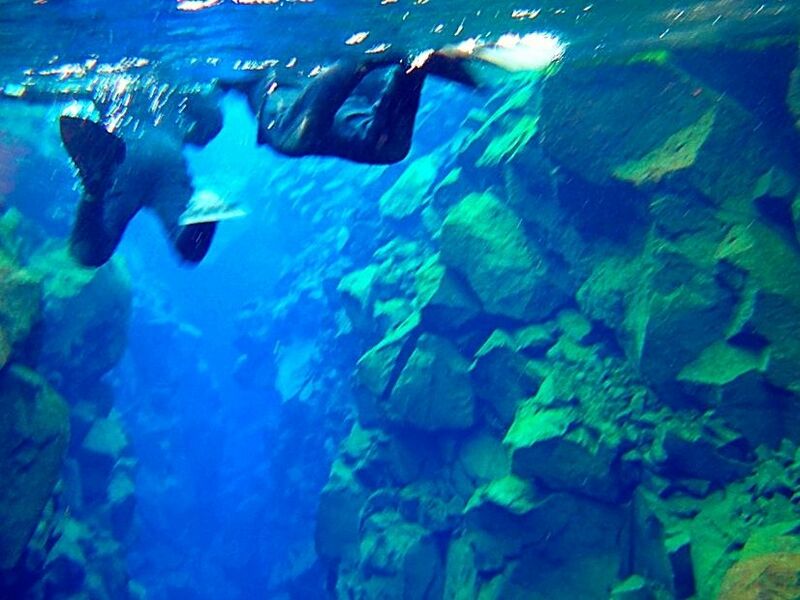 Which is why you can definitely snorkel Silfra even if you can't swim. 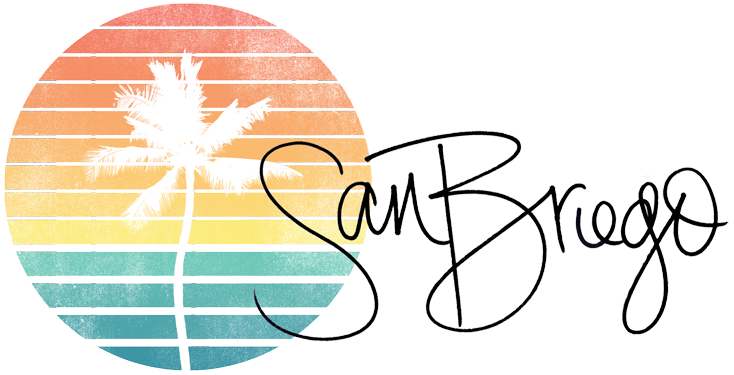 You don't have to tread water at all. In fact, even getting horizontal took a little work with the buoyancy. 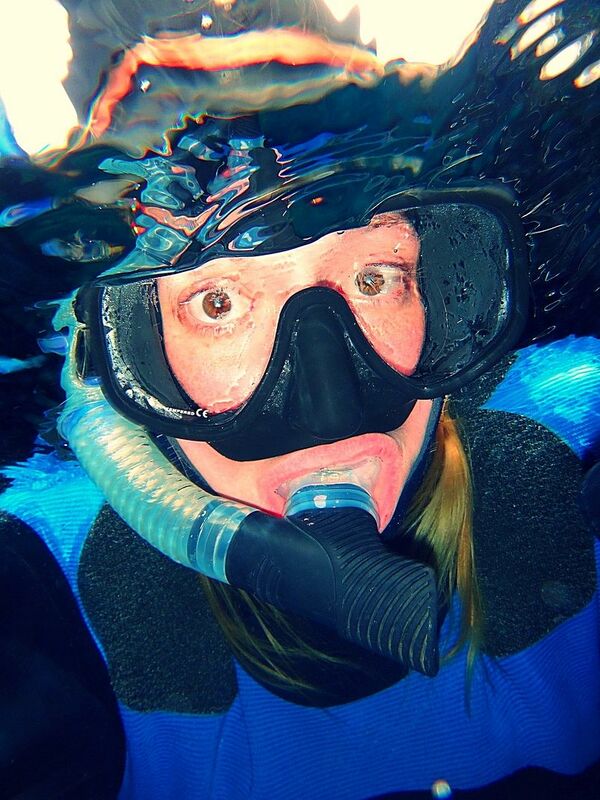 Then, once I did and put my face underwater, I was blown away. What I saw completely distracted me from the shock of the cold. 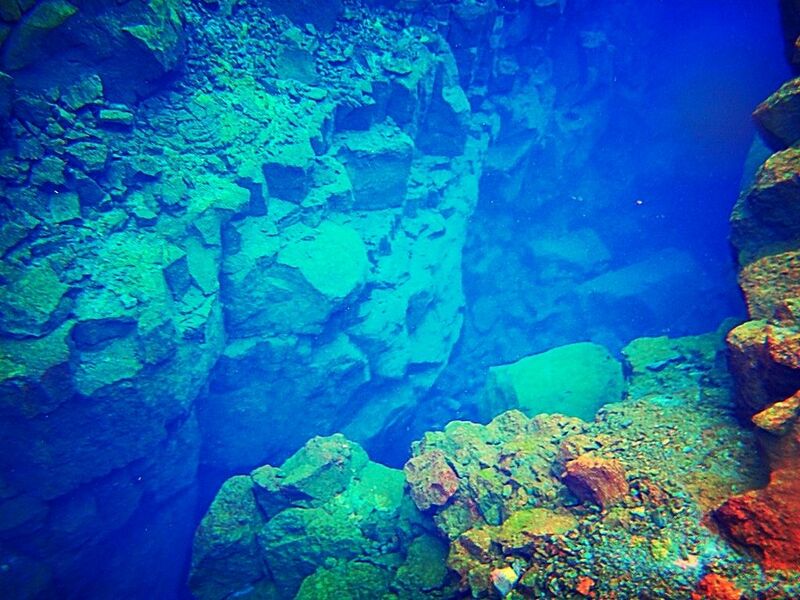 The underwater world of Silfra is breathtakingly beautiful. I was overcome with color, gradients of blues and yellows as the light hit the water at different depths. 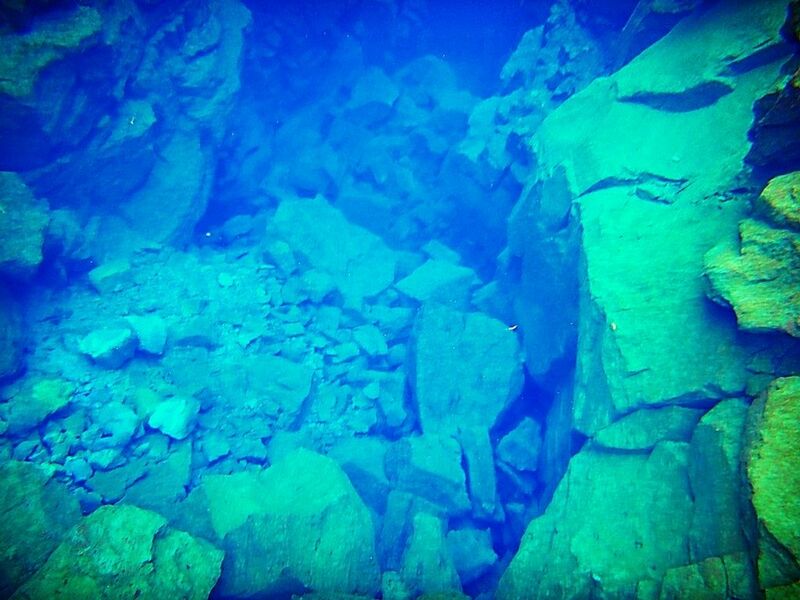 With the exception of some algae, there isn't much life to look at in Silfra what with it being 35°F and all. But that doesn't really matter when you're able to see 60 to 80 meters in any direction under water. It doesn't get much clearer than that. 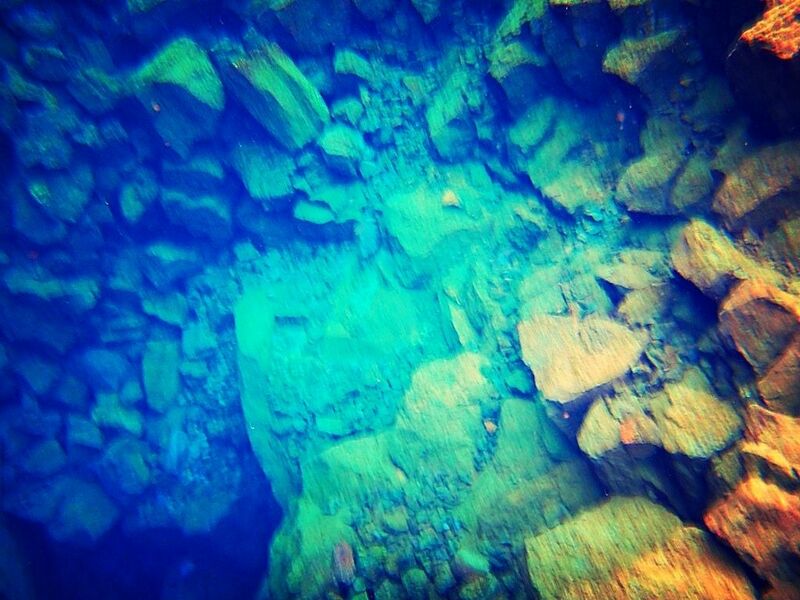 That clarity is due to the crazy filtration process the glacial water goes through before it enters the fissure. 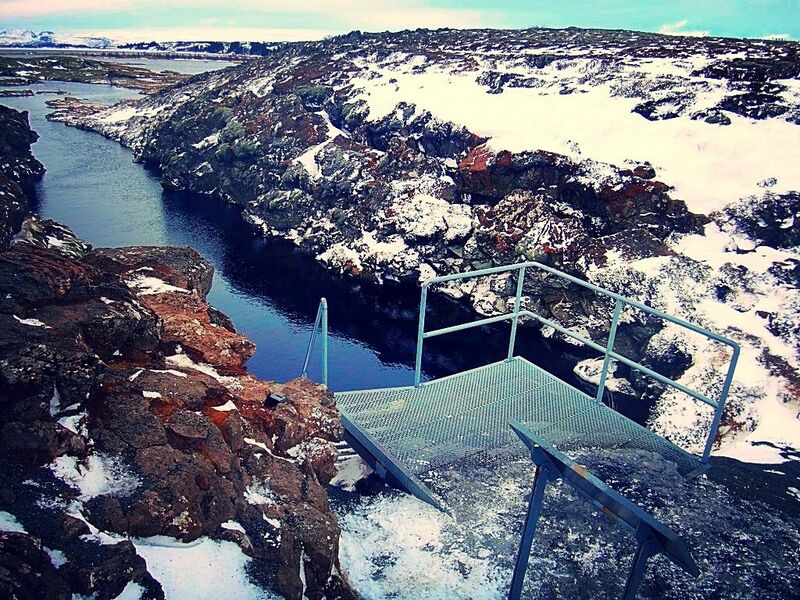 Ice from the Lángjökull Glacier melts and then filters through 30+ miles of lava rock before it reaches Silfra. In fact, it's so filtered that you can take off your mask and drink it, which we were encouraged to do. And as they promised, it was some of the most delicious water I've ever tasted. 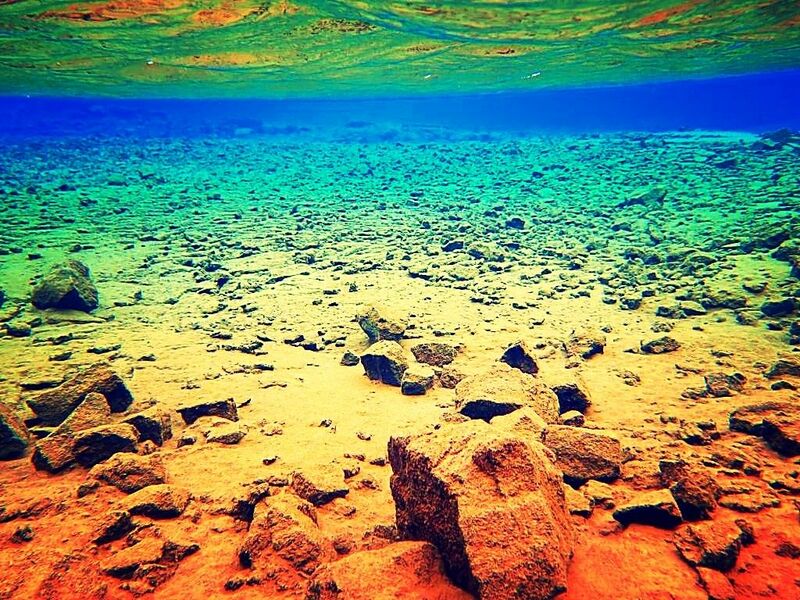 All said and done, this filtering process can take decades, resulting in unbelievable clarity underwater. 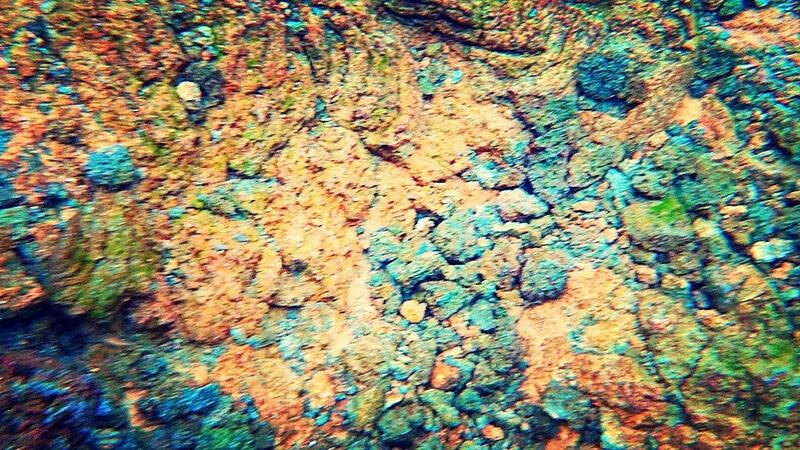 I was definitely glad that I brought my waterproof camera with me. Dive.IS has their own camera and will take plenty of gorgeous pictures for you, but it was amazing to be able to photograph some of it myself. 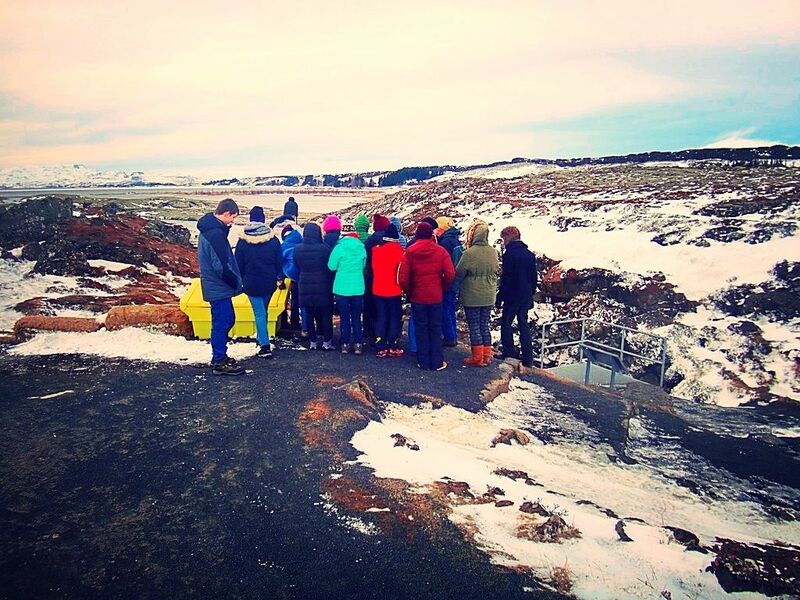 While we stared in awe at the world around us, our guides floated us through the three parts of Silfra: Silfra Hall, Silfra Cathedral and the Silfra Lagoon. The water current moved us along for the most part, so we didn't have to do much work except for the occasional kicking now and then. The 30ish minutes that we were in the water flew by. 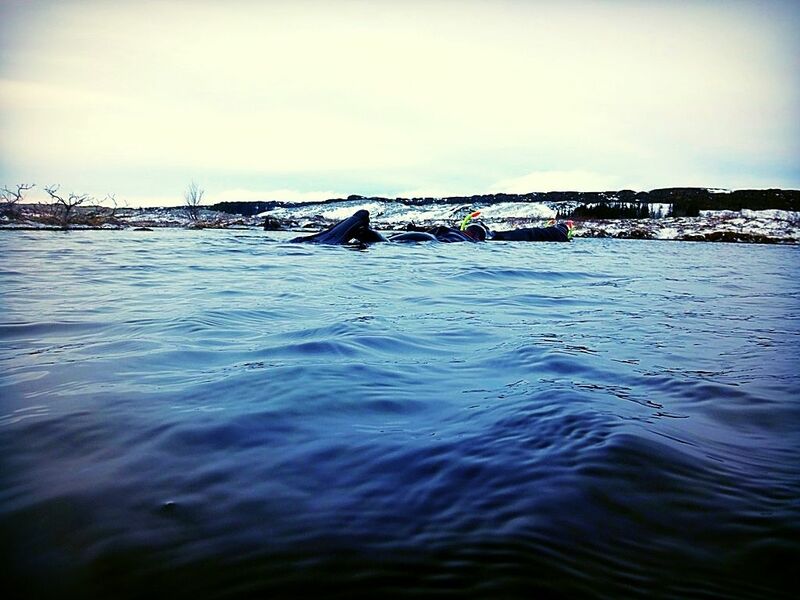 Silfra is not an out-and-back tour... it's point-to-point, so we I finally reached the end, the guides were waiting at a different platform to help each of us out of the water. 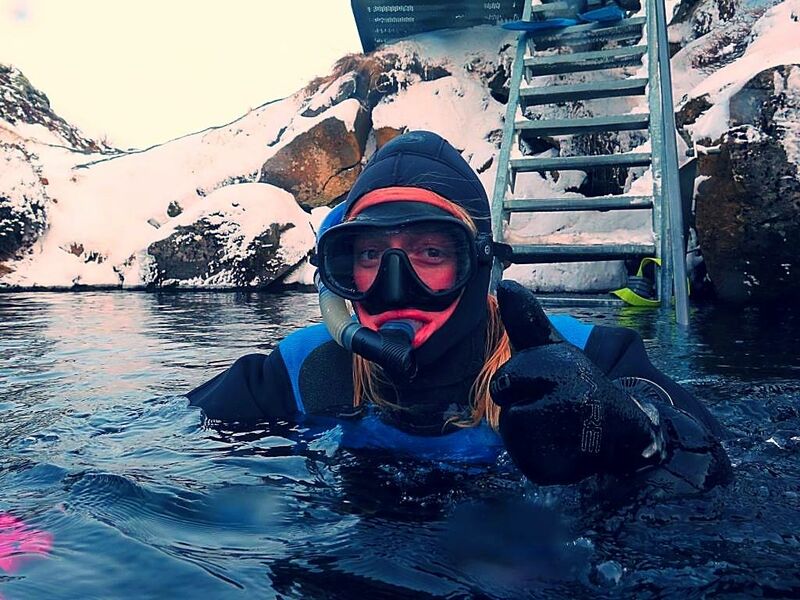 Even coming out of the ice cold water into the ice cold wind, I still wasn't that cold. 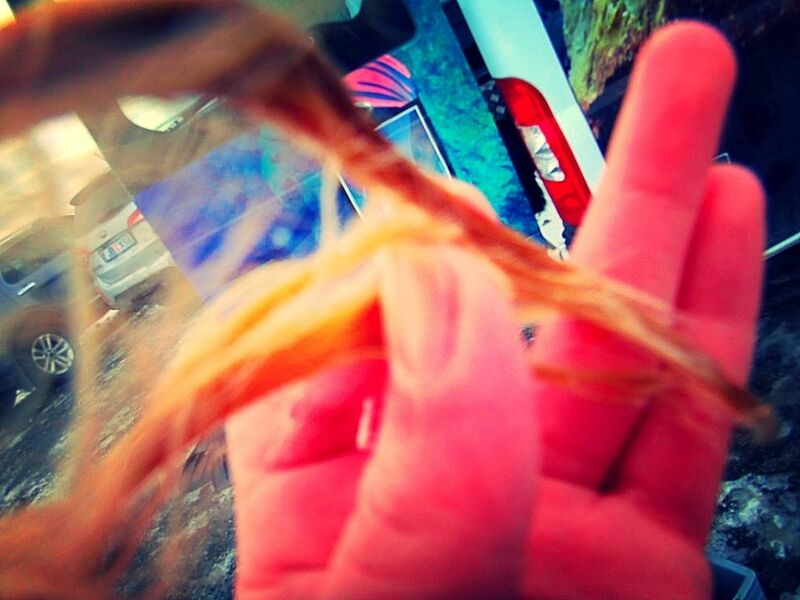 It was only on the long walk back to the shuttle that my hair begged to differ: it had been exposed to the water, so even though you can't tell from the pictures, it froze solid once it hit the air! I couldn't stop playing with it! I wanted to try cracking it in half so bad, but I was literally afraid it would break off. And it stayed that way for hours after! When we got back to the shuttles, the guides helped us out of our suits and handed us some hot chocolate and cookies to warm us up while they loaded up the equipment. After twenty minutes we were back on the road. 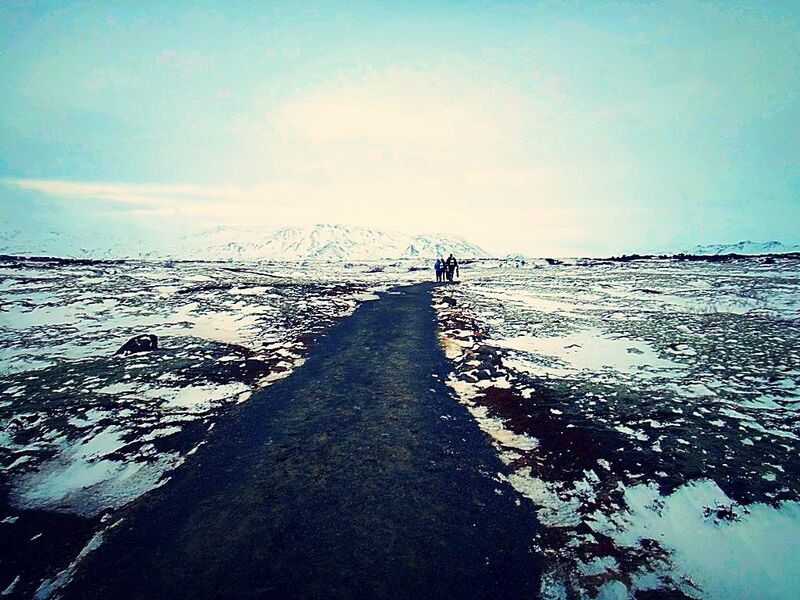 On the ride back to Reykjavik, I couldn't help but marvel at what I'd just done. 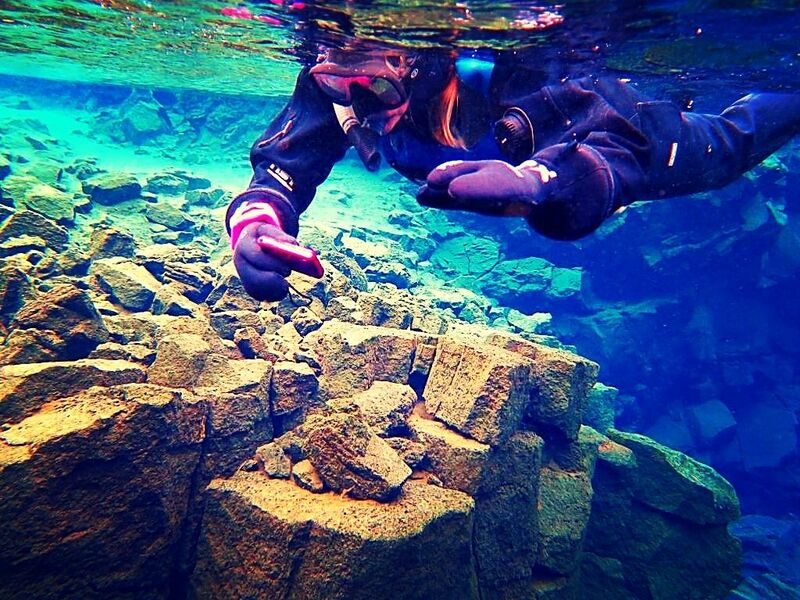 Silfra is a special, special place and a bucket list location for most divers. I couldn't believe I'd almost passed it up. 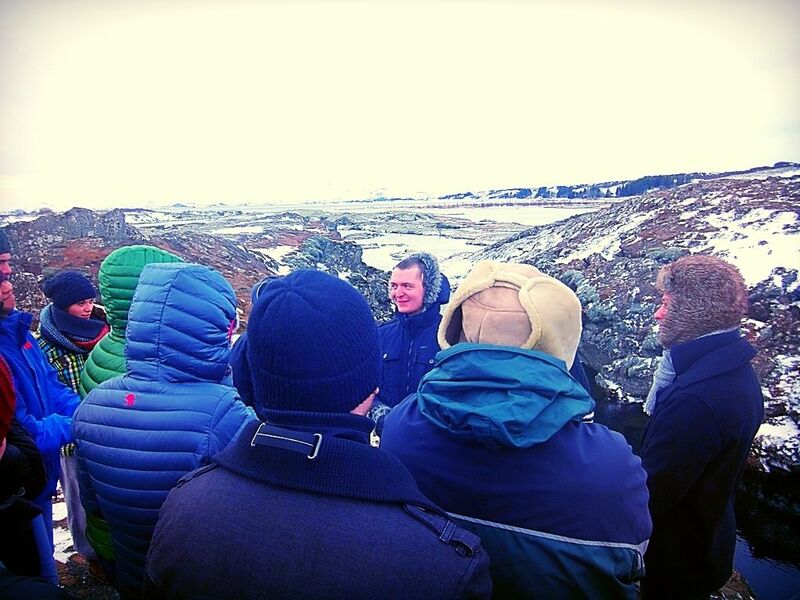 In fact, looking back now and thinking about how nervous and unsure I was about doing the tour, I realize that people need a little convincing for something like this, especially in the middle of winter. 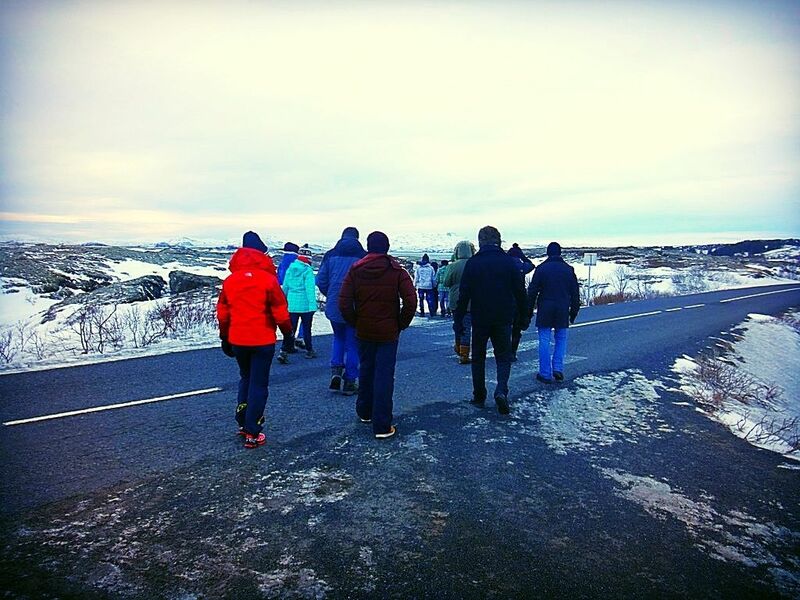 It might not be an activity that tops most tourists lists, but it is a must do and a truly once in a lifetime experience that also happens to be exclusive to Iceland. 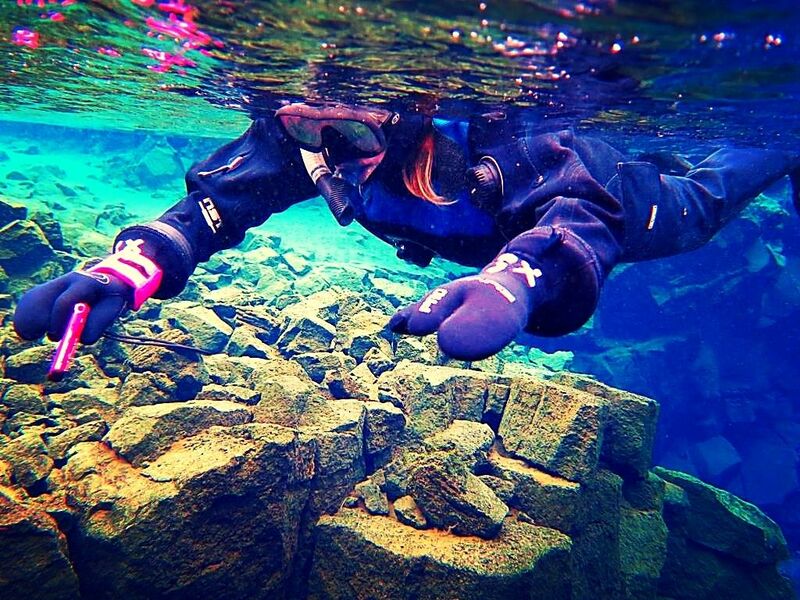 So ignore your fears about the cold and dive in - Silfra is not to be missed! 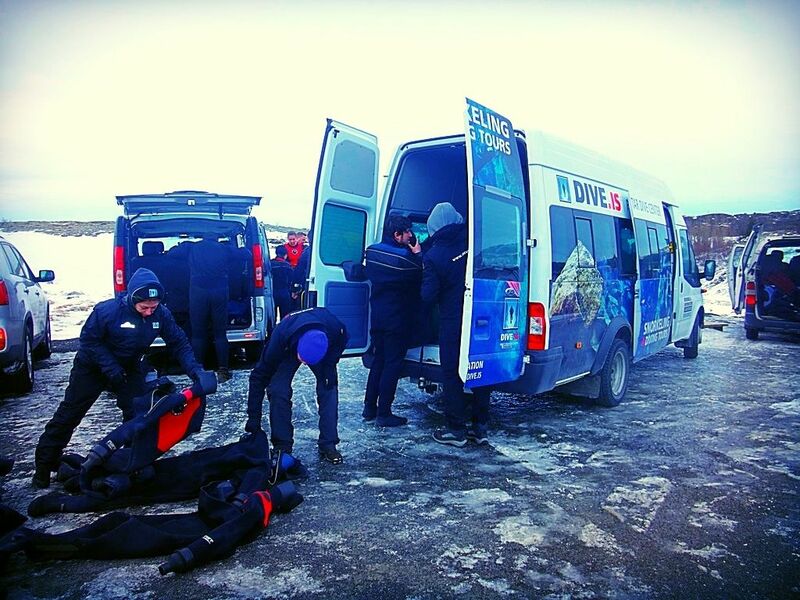 Thanks to Reykjavik Excursions and Dive.IS for sponsoring this post! 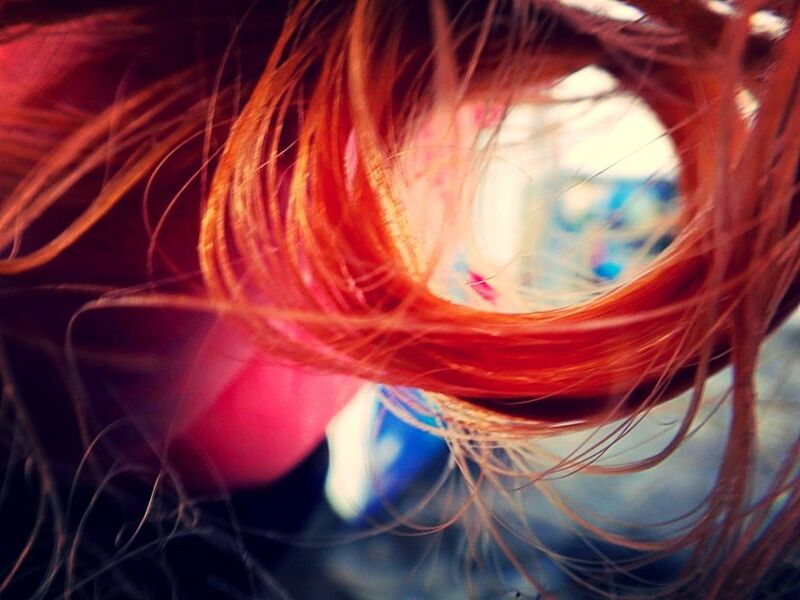 That sounds absolutely amazing, and these photos are awesome! What a fantastic experience. Totally jealous!